The End of Nuclear Power? Kazakh uranium miner Kazatomprom expects further revenue growth this year on higher prices, it said on Wednesday after posting a 112 percent jump in 2018 adjusted net profit on higher sales volumes and prices. London-listed Kazatomprom's net income adjusted for one-off transactions stood at 66.8 billion tenge (about $177 million), it said in a statement. The world's biggest uranium miner said it expected 2019 consolidated revenue of 485-505 billion tenge, with higher prices offsetting lower physical sales. For 2018, revenue rose 58 percent to 436.6 billion tenge while Kazatomprom's uranium <UX-U3O8-SPT> sales grew 65 percent in physical terms, it said. The electrification trend we outlined as key to our investment thesis calls for a slew of battery metals - lithium, graphite, nickel and cobalt - along with tonnes of rare earths and copper. And we havenâ€™t forgotten about how weâ€™re going to get all that extra energy needed to make the shift from fossil fuels to electric vehicles: nuclear energy. For this we need uranium. Demand for uranium is directly tied to the need for nuclear power, which is growing exponentially especially in Asia due to the problems with air pollution from coal-fired power plants. The global demand for electricity is expected to increase by 76% by 2030, and while everyone knows about the electric vehicle revolution, what is not often talked about is how will all that extra power be generated. Much of it will have to come from nuclear. According to nuclear consultant UxC, the global capacity for nuclear power is expected to grow by 27% between 2015 and 2030. That means a whole lot more uranium. UxC estimates annual uranium demand will spike by nearly 60%, from the current 190 million pounds of U3O8, the nuclear fuel, to 300 million pounds by 2030. 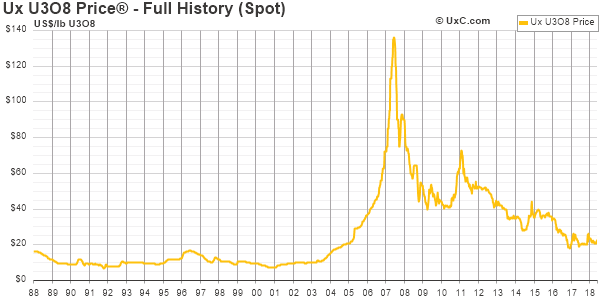 While the uranium price has been suppressed since 2011 when it took a major hit due to the nuclear accident cause by the tsunami in Japan, things are looking up. Uranium supply has been steadily dropping since 2016. That year total mined supply was around 163 million pounds, in 2017 it was 154 million, and in 2018 it was under 135 million. With current U3O8 demand at 192 million pounds, that leaves a shortfall of at least 57 million pounds. Where will this extra uranium come from? While production at big Canadian uranium mines McArthur River and Rabbit Lake have been suspended due to low prices (at current prices, about three-quarters of uranium mines are uneconomic) exploration is going full tilt in the Athabasca Basin of Saskatchewan, the worldâ€™s richest source of uranium ore - with junior miners anticipating the return of higher prices. The long wait might finally be over: uranium was the best-performing metal of 2018. The net result is that uranium has entered a period of structural undersupply and we forecast the beginnings of inventory drawdown, which should continue to provide upward bias to the uranium price as we exit the year. Inventories can be divided into two broad categories; strategic and excess inventories, with the definition of each somewhat subjective. If utilities begin to worry about the security of future supplies then excess inventories can quickly be reclassified as strategic, leading to a shift in purchasing strategies. 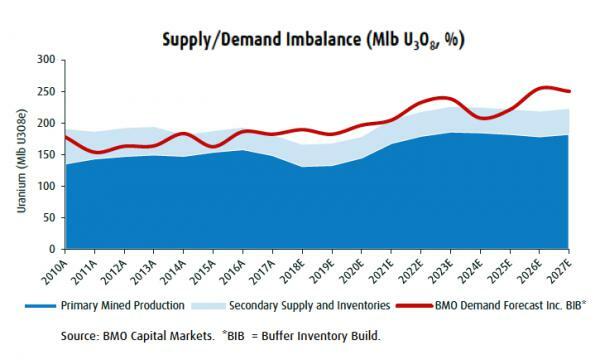 This tipping point is hard to predict, but could occur soon given the rapid decline in uranium output and the difficulty of securing future offtake agreements at current prices. PARIS (Reuters) - France aims to reduce the share of electricity produced by nuclear reactors to 50 percent from 75 percent now by 2035, Environment Minister Francois de Rugy said on Sunday. WASHINGTON, Oct 19 (Reuters) Ã¢â‚¬â€œ The U.S. Environmental Protection Agency said on Friday it has withdrawn a regulation proposed in the last days of the Obama administration that aimed to tighten health and safety compliance rules for uranium miners. On Jan. 19, 2017 Ã¢â‚¬â€œ a day before Donald Trump took office as president Ã¢â‚¬â€œ the EPA had proposed standards to regulate by-product materials produced by uranium in-situ recovery (ISR) activities, with a primary focus on groundwater protection and restoration.The National Mining Association hailed the decision. Among the major Australian miners, both BHP and Rio Tinto own uranium assets. However, they form a relatively small part of the big minersÃ¢â‚¬â„¢ portfolios, being dwarfed by iron ore, coal, and copper. Cameco is the largest listed, pure-play uranium mining company in the world. Cameco is traded on both the Toronto Stock Exchange, and the New York Stock Exchange. Paladin Energy (ASX:PDN) - Placed in Care & Maintenance in May. Energy Resources Australia (ASX:ERA) - Permanently closed, processing stockpiles. A-Cap Resources (ASX:ACB) - Exploration, Preliminary Feasability Study expected in 2018/2019. Berkeley Resources (ASX:BKY) - Construction recently begun. Bannerman Resources (ASX:BMN) - Definitive Feasability Study complete, pilot plant complete. Boss Resources (ASX:BOE) - Care & Maintenance, restart recently announced. Deep Yellow (ASX:DYL) - Exploration, measured resource, scoping study not yet completed. Peninsula Energy (ASX:PEN) - In production. Toro Energy (ASX:TOE) - Preliminary Feasability Study completed. Vimy Resources (ASX:VMY) - Definitive Feasability Study completed, trial mining completed. 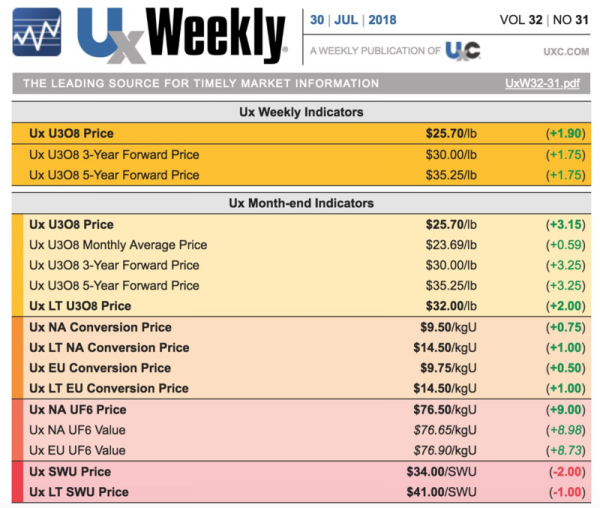 July 2018 saw the largest one month increase in long-term uranium prices since November 2014. The recent rise in prices comes in response to supply cuts, which could result in upward pressure for the long term. Kazatomprom, the worldÃ¢â‚¬â„¢s biggest uranium producer based in Kazakhstan, said in December it was cutting output by 20%. Last month, CanadaÃ¢â‚¬â„¢s Cameco Corp. announced it would suspend operations at its big McArthur River and Key Lake mines indefinitely. Supply is dropping at the same time demand is poised to rise. Lots of traders pumping Uranium stocks, while Cameco lays of 700 staff and suspend operations at McArthur River and Key Lake , citing "the weak uranium market "
(Bloomberg) Ã¢â‚¬â€ The Trump administration began an investigation into whether uranium imports threaten national security, a move that may lead to tariffs on the nuclear power plant fuel. The Commerce Department said Wednesday it will probe Ã¢â‚¬Å“whether the present quantity and circumstances of uranium ore and product imports into the U.S. threaten to impair the national security.Ã¢â‚¬Â The probe will cover the entire uranium sector, from the mining industry to enrichment, defense and industrial consumption, the department said. The past three decades has seen an explosion in the demand for virtually every commodity. Expecting higher commodity prices, investors pour money into the mining industry for a miniscule cost of capital, hoping that increased demand translates into outsized profits. Ironically, they actively undo their expectations. Expectations of supply-demand situations are often wrong. With thousands of mines of every commodity spread around the world, whose production capabilities are not fully known to the market, commodities experts consistently struggle to predict the future supply situation. Constantly changing technologies, and substitution opportunities are just two factors that leave experts struggling to predict future demand accurately. This situation is muddled further by marketing done by entrenched interests that profit from convincing the public about commodities going a certain way.